Tiago Mestre: Night. Inextinguishable, inexpressible, night. 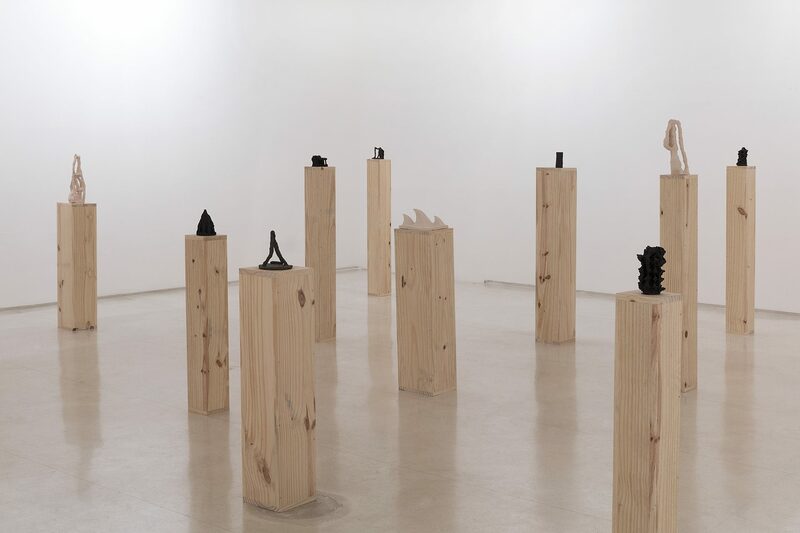 Tiago Mestre’s first solo show at Galleria Millan – Night. Inextinguishable, inexpressible, night. 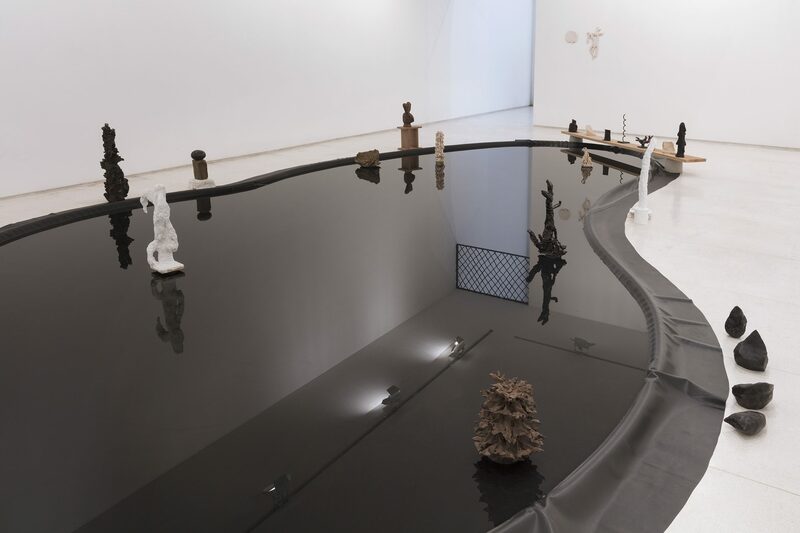 – is structured around a large reflecting pool installed inside the exhibition space. 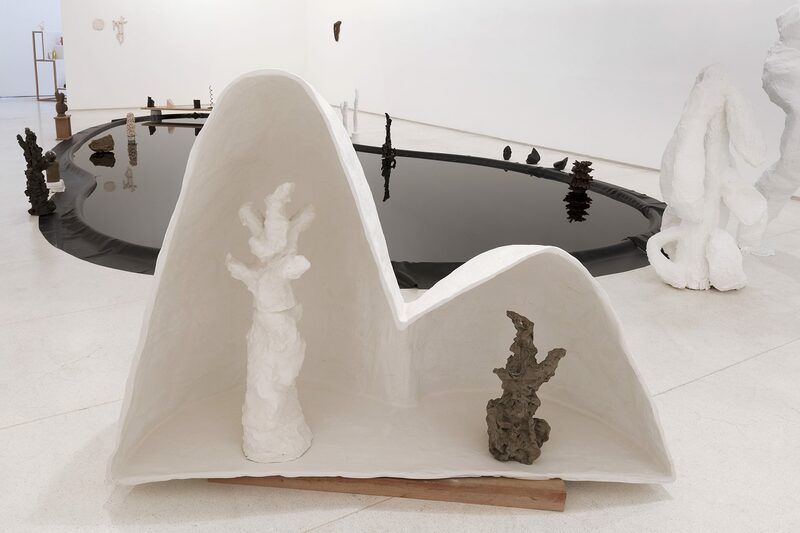 By reproducing this landscape element on a scale close to what we perceive to be its natural proportions, the artist creates a focal point that immediately attracts the viewer’s gaze and serves as the axis for a kind of mise-en-scène in which sculptural objects in a variety of styles are both characters and stage props in a polyphonic and non-linear narrative. With a degree in architecture, Mestre has a keen awareness and intimacy regarding the codes that govern the representation and construction of spaces, and how these codes are deliberately manipulated to express certain values (be they cultural, ideological, political or market), as well as to privilege particular aspects of human experience. 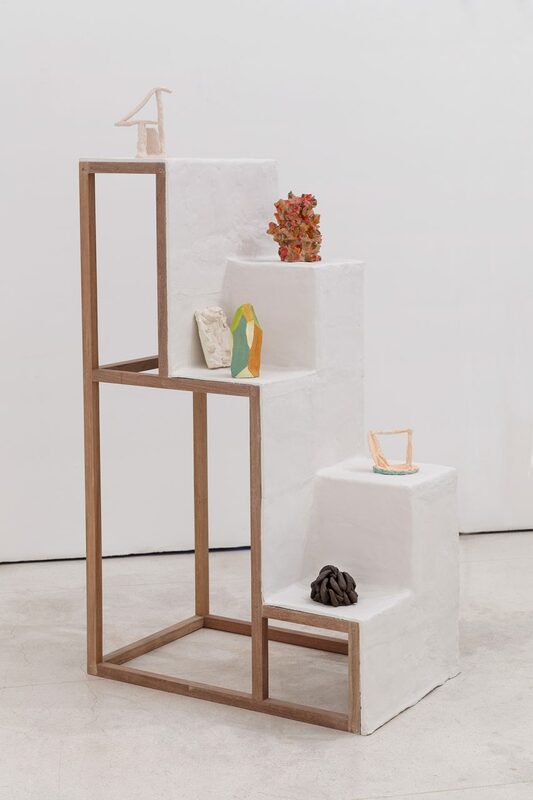 And yet, while references to architectural language and its devices are evident in his work, his approach is far less analytical than intuitive, perhaps because of his fluency with the discipline. 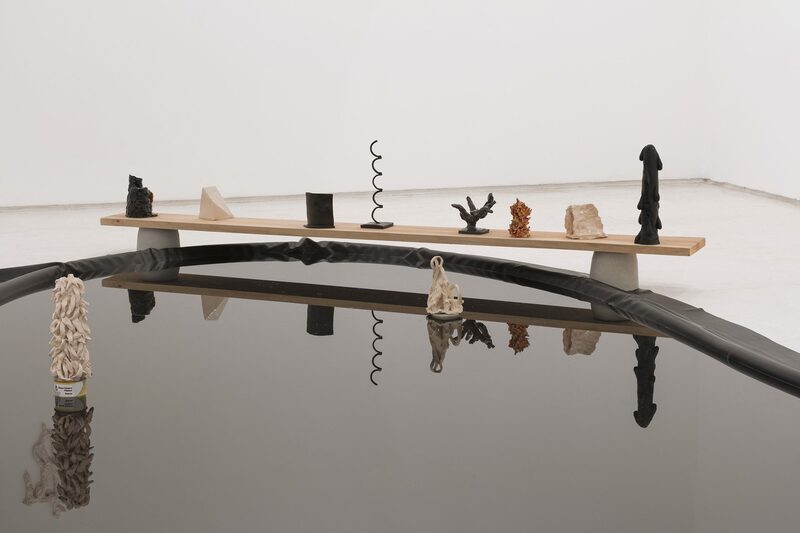 In fact, this quality allows him to move at will between the different instances of an idea that stems from architecture or, more precisely, from the notion of design, to question the status of the various elements that make up this exhibition. 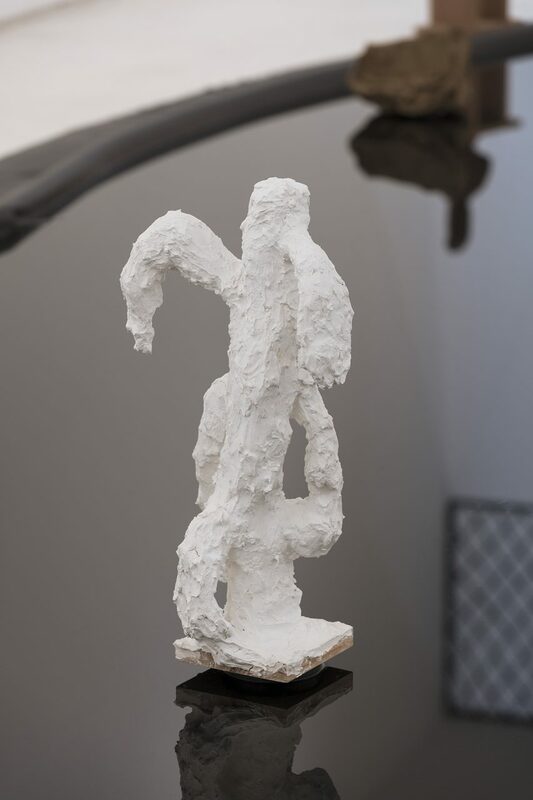 This operation of suspending certainties in relation to the condition of the object is played out more visibly in the works whose forms retain some indicator of functionality. 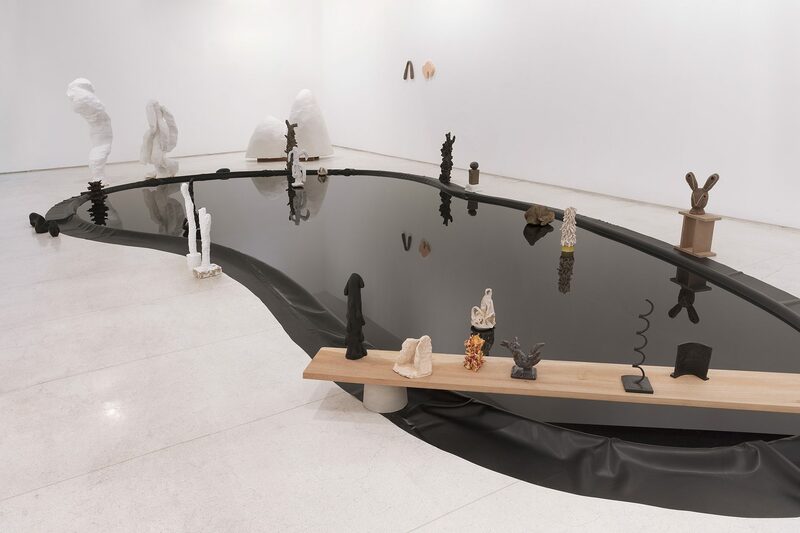 The reflecting pool is a case in point: its generous scale suggests a landscape element, while being closer to a stage set because it is a temporary construction and, at the same time, due to its location in an art gallery, is immediately understood as an installation. 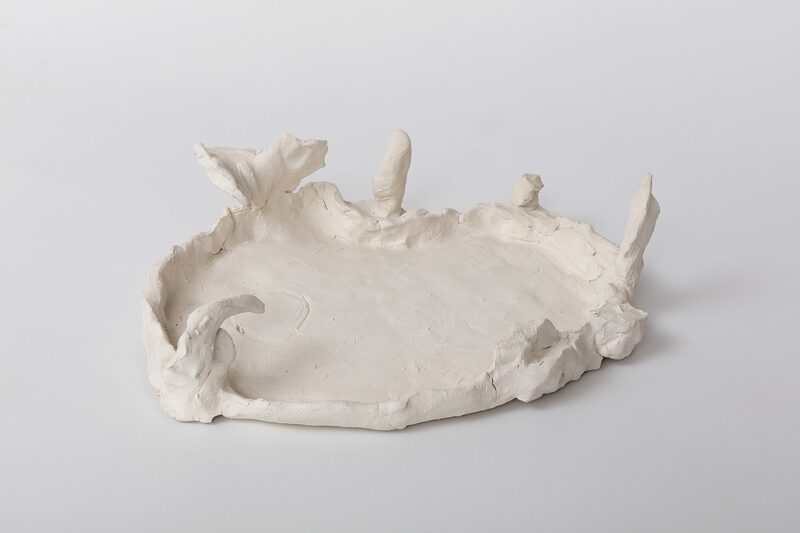 To further complicate matters, one of the small white ceramic sculptures on display roughly mimics the lake’s amoeboid shape, including the sculptures that populate it. Although lacking the necessary rigor to be mistaken by an architectural model, this small piece once again takes us back to the idea of design and creates a mirroring game in which the various instances of representation are intertwined and superimposed like in a matryoshka: from the incorporation of the representation of nature in architecture, passing through scenography and finally arriving at the model. On the other hand, the uncertain or hesitant condition of these objects is equally a product of their characteristic materiality. 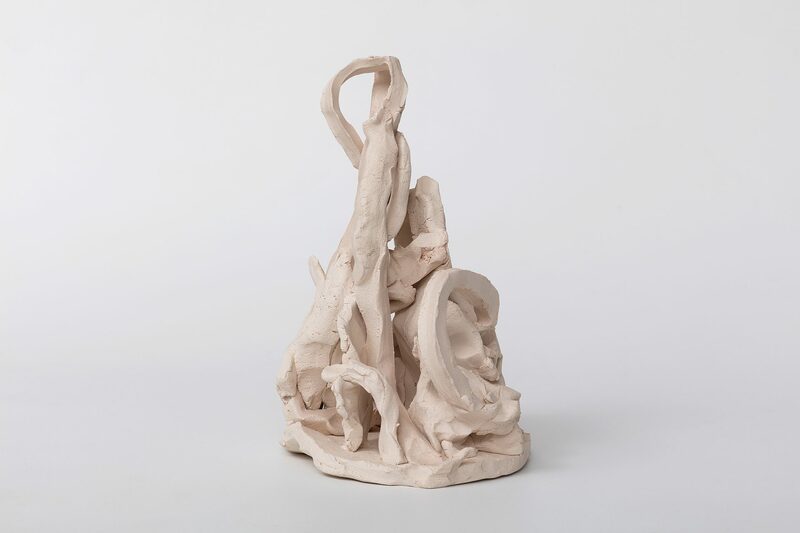 The clay or ceramic sculptures, which make up most of the works presented in this exhibition, are created in a straightforward and simple way, with an organic and apparently spontaneous form that clearly contrasts the language of architectural design. 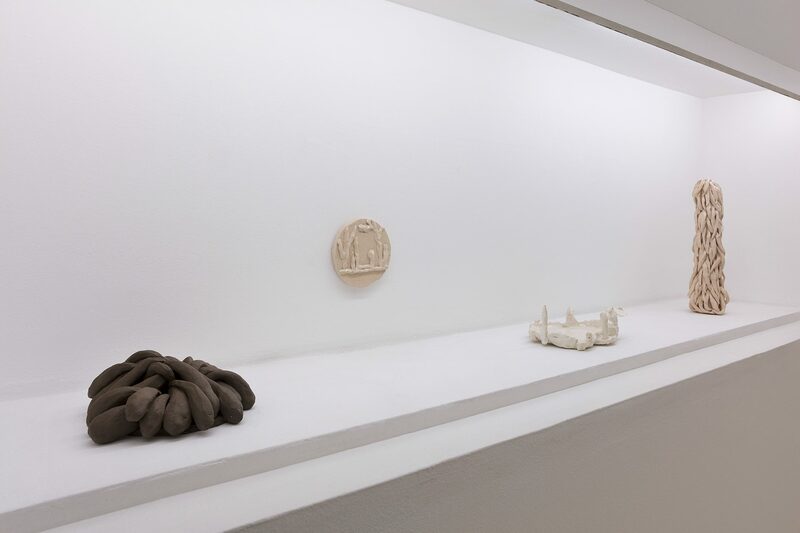 The logic of empiricism that characterizes autochthonous architecture also permeates the making of the mashrabiya installed at the entrance to the gallery’s main space. 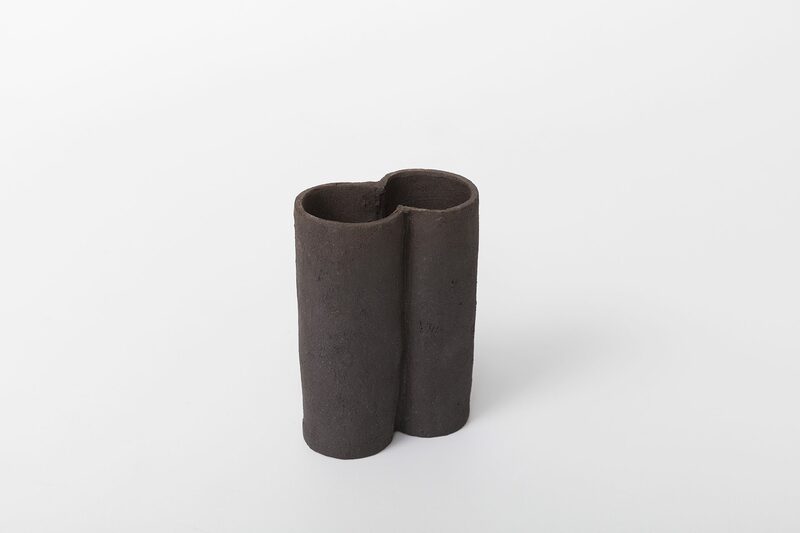 This piece, incorporated as an architectural element in the exhibition space, somehow synthesizes the relationship between drawing and object that underlies the very concept of design. As is known, mashrabiyas are traditionally made by crossing individual strips of building material, usually wood or metal, to form different patterns. In this case, however, the artist inverts the construction process, starting from the pattern of the lattice to then create the object. 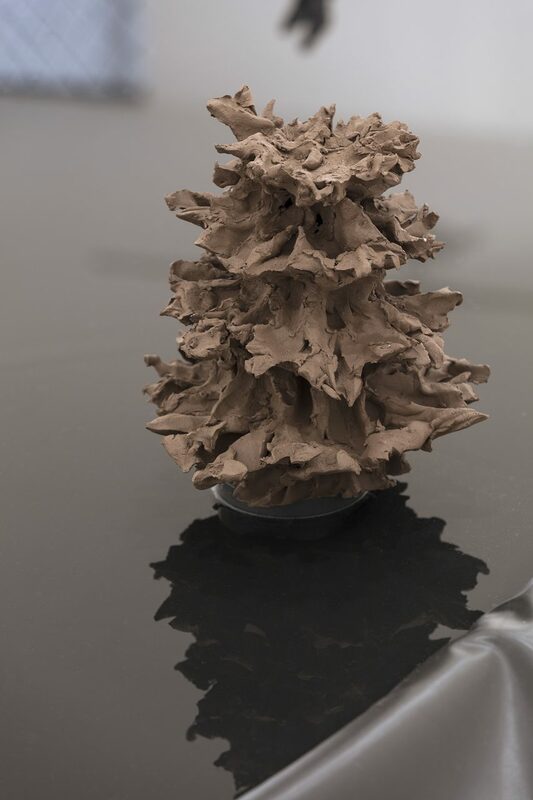 The pattern is drawn directly onto a kind of sand bed and the grooves produced on the surface are subsequently filled with cast bronze in a method that ends up preserving the imperfections produced by this inverted process. 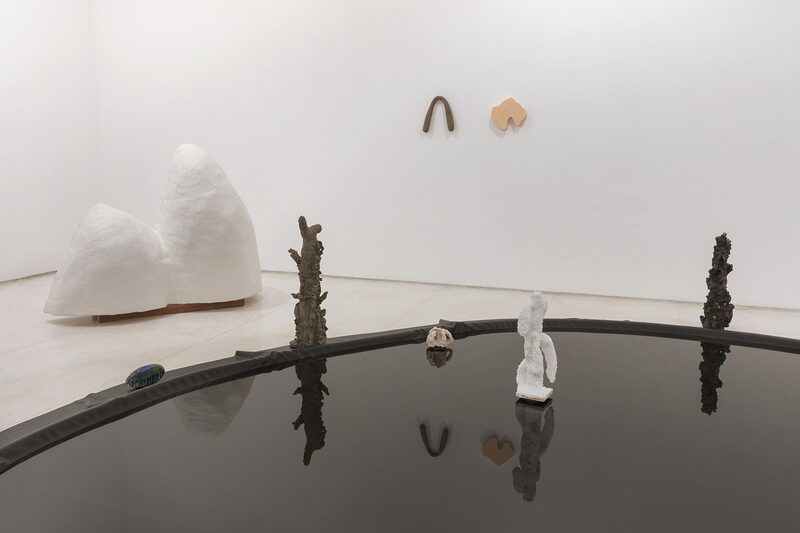 In other cases, the sculptures take on even more organic configurations that evoke undetermined plant forms, like tropical plants that grow wildly and lusciously to compose the exhibition environment. 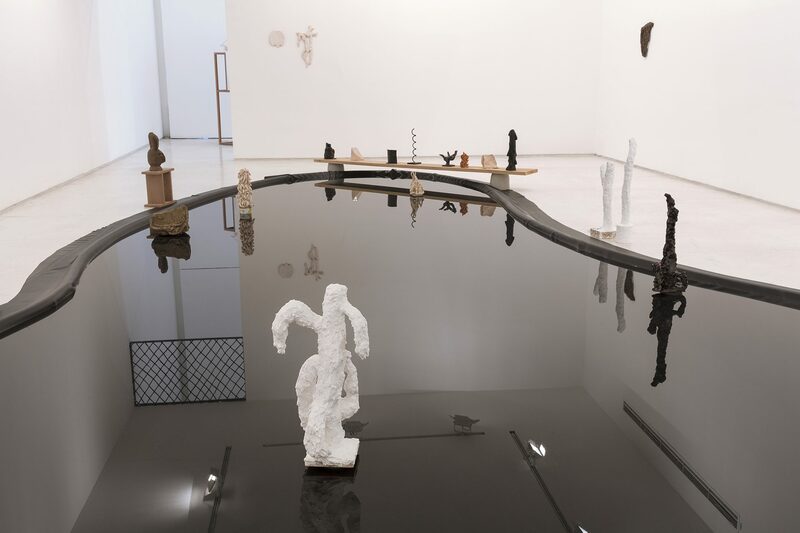 This environment, of course, is carefully planned by the artist precisely to create a spatial situation in which the spectator’s experience and gaze are the constant target of a subversion of expectations and certainties. The notion of design evoked by Mestre in this exhibition is undoubtedly inspired by the modernist architecture of the tropics, with its sensual forms that coexist with exuberant nature. 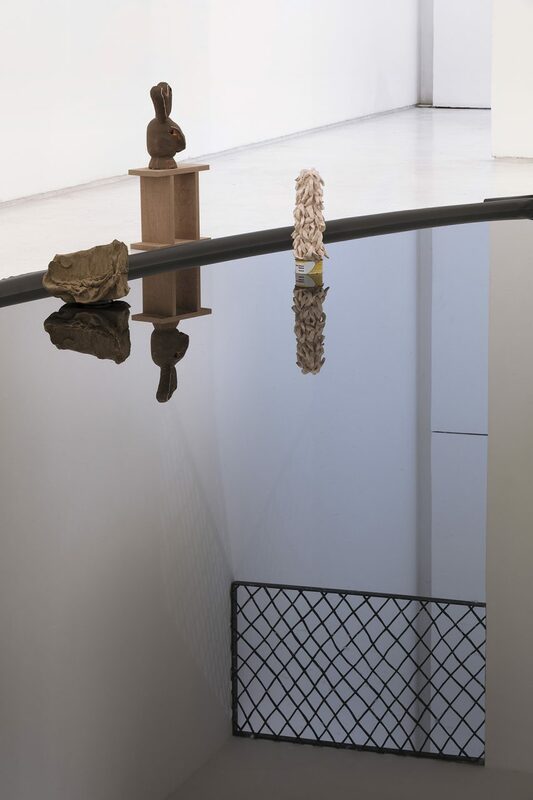 However, rather than simply taking a stance of praising or criticizing this architecture or making judgments about its success or failure in posterity, he situates his work in a grey area that seems to incorporate both sides while simultaneously addressing the subject with a great deal of humor and lightness. 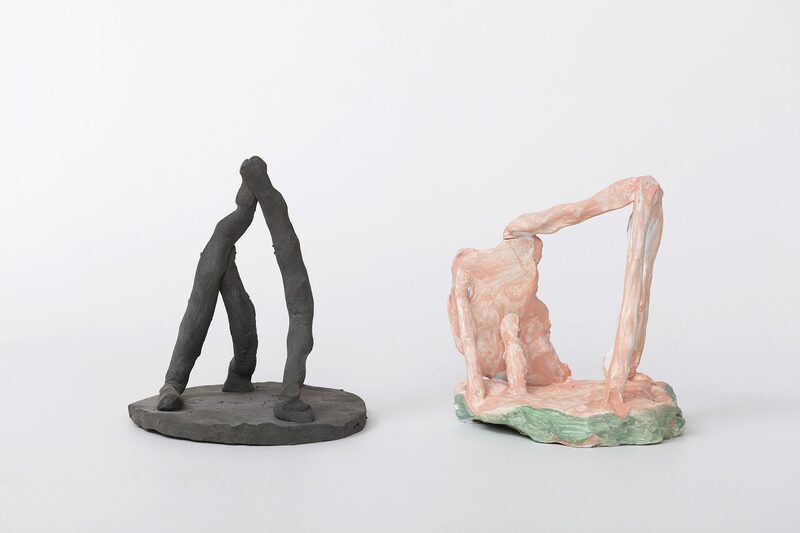 His works betray a certain self-mockery that reveals a kind of skepticism towards the critical scope of artistic activity, since art normally operates within even more elitist circles than architecture, whose public face is much more noticeable in daily life. 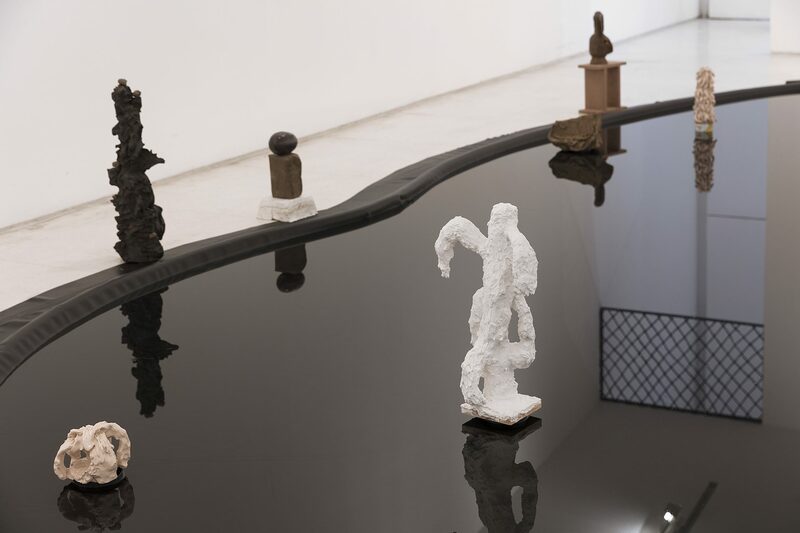 Instead of an assertiveness of intentions, Mestre prefers to cultivate a polyphonic and dynamic situation in which the viewer is constantly led to inquire about what he sees without ever arriving at a definitive answer. 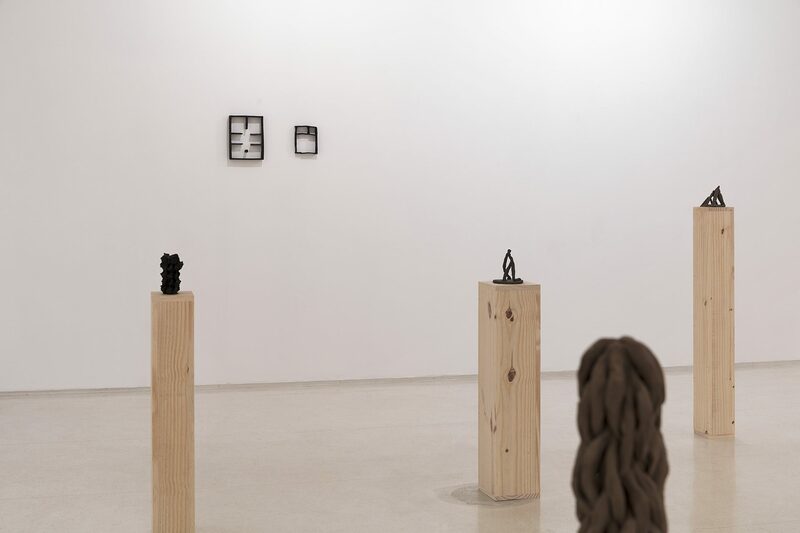 Like the title chosen by the artist for this exhibition, taken from a poem by Portuguese poet Helberto Helder (1930-2015), the group of works shown in Night. Inextinguishable, inexpressible, night. 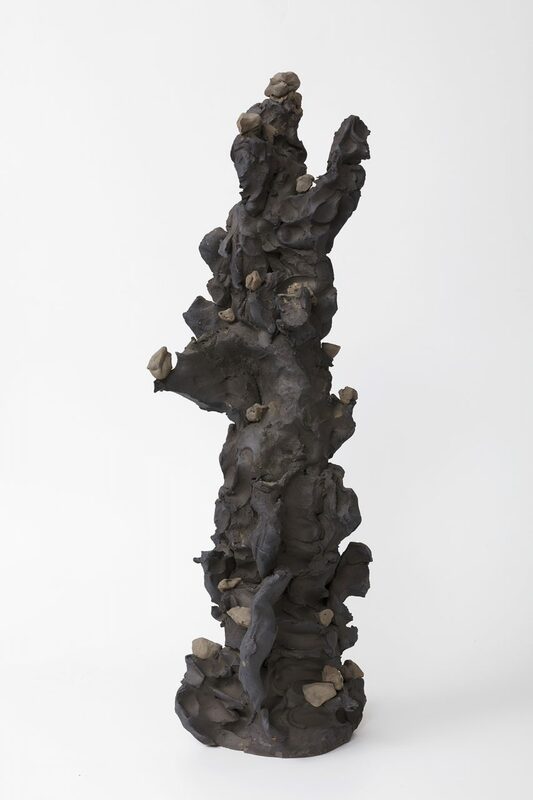 opens itself to a diversity of experiences and interpretations where meanings are not predetermined, sometimes conveying mysterious images that could belong to the surrealist lineage that marked the beginning of Helder’s career. 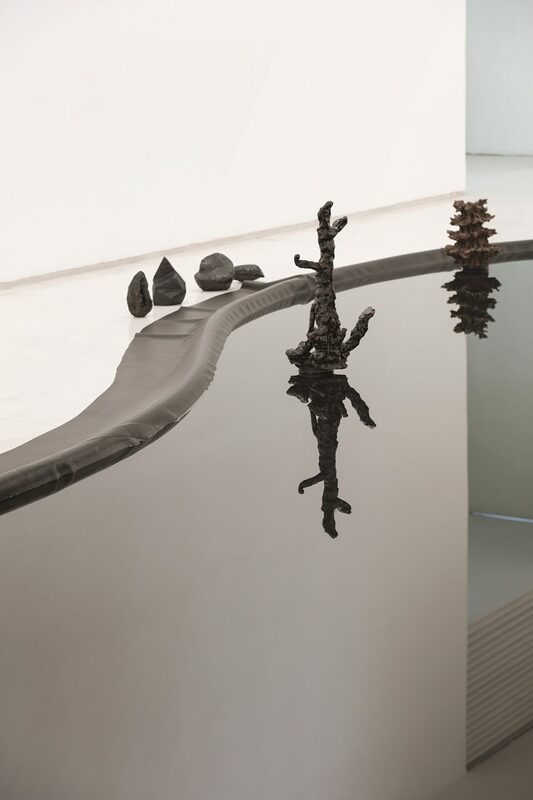 Pau que chora [Crying Stick], a modest sculpture representing a small tree trunk with a surface covered with dripping tears, is all of this: parody and lament, mockery and criticism, cartoon and art. It is, perhaps, the ancestral Brazilwood that mourns its destiny. Tiago Mestre: Noite. Inextinguível, inexprimível noite. Noite. Inextinguível, inexprimível noite. 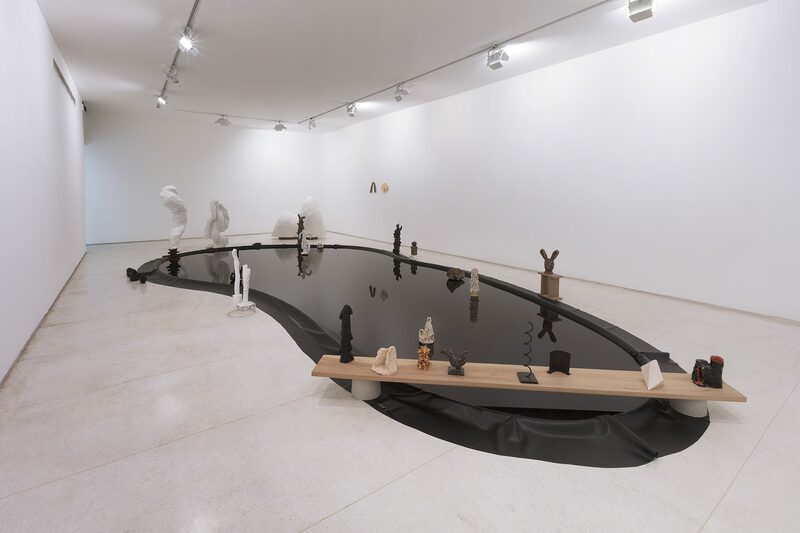 – a primeira exposição individual de Tiago Mestre na Galeria Millan – se organiza em torno de um grande espelho d’água instalado no interior do espaço expositivo. Ao reproduzir esse elemento paisagístico numa escala próxima o suficiente daquilo que percebemos como suas proporções naturais, o artista cria um ponto focal que imediatamente atrai o olhar do espectador e serve de eixo para uma espécie de mise-en-scène, na qual objetos escultóricos executados em uma variedade de estilos são ao mesmo tempo personagens e objetos de cena, em uma narrativa polifônica e não linear. Com formação em arquitetura, Mestre possui consciência e intimidade aguçadas em relação aos códigos que regem a representação e a construção dos espaços, e sobre como esses códigos são deliberadamente manipulados para exprimir certos valores (sejam eles culturais, ideológicos, políticos ou mercadológicos), ou para privilegiar determinados aspectos da experiência humana. E, no entanto, embora as referências à linguagem arquitetônica e seus dispositivos sejam evidentes em seu trabalho, sua abordagem é muito menos analítica do que intuitiva, talvez até mesmo em razão de sua fluência com a disciplina. De fato, essa qualidade lhe permite transitar à vontade entre as diferentes instâncias de um pensamento que parte da arquitetura ou, mais precisamente, da noção de projeto, para colocar em cheque o status dos vários elementos que compõem esta exposição. Essa operação de suspensão de certezas a respeito da condição do objeto se dá, mais visivelmente, nos trabalhos cujas formas retêm algum índice de funcionalidade. O próprio espelho d’água pode ser considerado um caso exemplar: sua escala generosa sugere um elemento paisagístico em si, porém estaria mais próximo de uma cenografia, por se tratar de uma construção temporária; ao mesmo tempo, devido à sua localização em uma galeria de arte, é imediatamente lido como uma instalação. Para complicar ainda mais as coisas, uma das pequenas esculturas em cerâmica branca apresentadas na exposição reproduz toscamente o formato ameboide do lago, incluindo as esculturas que o habitam. Ainda que destituída do rigor necessário para ser confundida com uma maquete arquitetônica, essa pequena peça nos remete mais uma vez à ideia de projeto e cria um jogo de espelhamento no qual as várias instâncias da representação se entrelaçam e se sobrepõem como numa matrioshka: desde a incorporação da representação da natureza na arquitetura, passando pela cenografia, até a maquete. Por outro lado, a condição incerta ou hesitante desses objetos é igualmente produto de sua materialidade característica. As esculturas em argila ou cerâmica, que constituem a maioria dos trabalhos apresentados nesta mostra, são executadas de modo direto e simples, com uma organicidade e aparente espontaneidade de formas que contrastam manifestamente com a linguagem projetual da arquitetura. A lógica do empirismo que caracteriza a arquitetura autóctone também permeia a feitura do muxarabi instalado no acesso à sala principal da galeria. Essa peça, incorporada como elemento arquitetônico no espaço expositivo, sintetiza de certa forma a relação entre desenho e objeto que subjaz ao próprio conceito de projeto. Como sabemos, os muxarabis são tradicionalmente construídos a partir da sobreposição de ripas individuais que criam diferentes padrões, mas nesse caso o artista inverte o processo de construção, partindo do desenho da trama para criar o objeto. O padrão é desenhado diretamente sobre uma espécie de cama de areia e os sulcos produzidos na superfície são subsequentemente preenchidos com bronze fundido, num método construtivo que acaba por preservar as imperfeições desse processo ao avesso. Em outros casos, as esculturas assumem configurações ainda mais orgânicas, que evocam algum tipo de forma vegetal indeterminada, como plantas tropicais que brotam desordenada e voluptuosamente para compor o ambiente do espaço expositivo. Esse ambiente, claro, é planejado com cuidado pelo artista, justamente para criar uma situação espacial na qual a experiência e o olhar do espectador tornam-se o alvo constante de uma subversão de expectativas e certezas. A ideia de projeto evocada por Mestre nesta exposição sem dúvida remete à arquitetura modernista dos trópicos, com suas formas sensuais, que convivem com uma natureza exuberante. No entanto, em vez de tomar um partido de simples exaltação ou crítica a essa arquitetura ou de fazer julgamentos quanto ao seu sucesso ou fracasso na posteridade, ele situa seu trabalho numa zona de ambiguidade que parece incorporar ambos os lados, ao mesmo tempo que aborda o assunto com uma grande dose de humor e leveza. Há em seus trabalhos uma certa autoironia que revela uma espécie de ceticismo quanto ao alcance crítico da atividade artística, já que esta normalmente opera dentro de circuitos ainda mais elitistas do que a arquitetura, cuja face pública é muito mais perceptível em nosso cotidiano. No lugar de uma assertividade de intenções, Mestre prefere cultivar uma situação polifônica e dinâmica, em que o espectador é constantemente levado a indagar sobre aquilo que vê, sem nunca encontrar uma resposta definitiva. Assim como o título escolhido pelo artista para esta mostra, emprestado de um poema do poeta português Helberto Helder (1930-2015), o conjunto de trabalhos que integram Noite. Inextinguível, inexprimível noite. se abre para uma diversidade de experiências e interpretações nas quais nada é oferecido de antemão, por vezes trazendo imagens misteriosas que poderiam pertencer à linhagem surrealista que marcou o início da carreira de Helder. 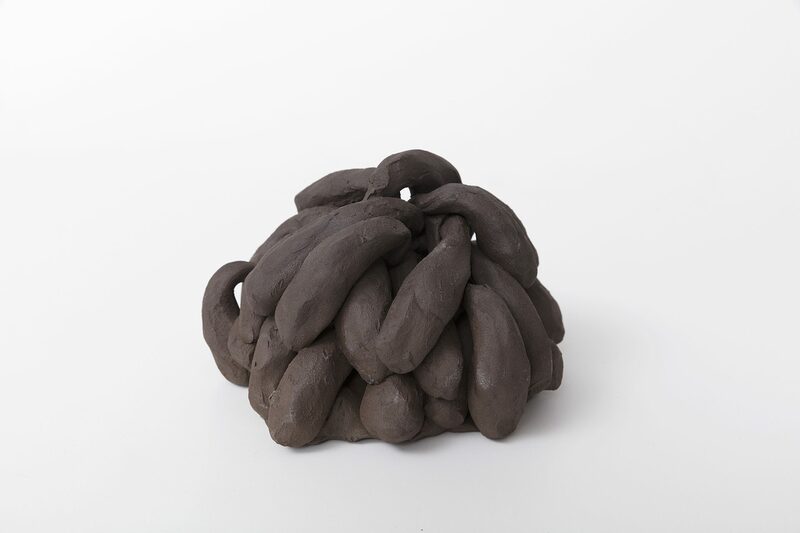 Pau que chora, modesta escultura que representa um pequeno tronco de cuja superfície escorrem lágrimas, é tudo isso: paródia e lamento, troça e crítica, cartum e arte. É, quem sabe, o pau-brasil ancestral que chora o seu destino.